As you might expect from one of the world’s most iconic cities, Edinburgh has a wide range of superb hotels to choose from. Here we have listed the top 10 hotels in Edinburgh based on facilities, service and location. We have taken care to include options for every budget. The Balmoral Hotel isn't just a 5-star hotel: it's a landmark. 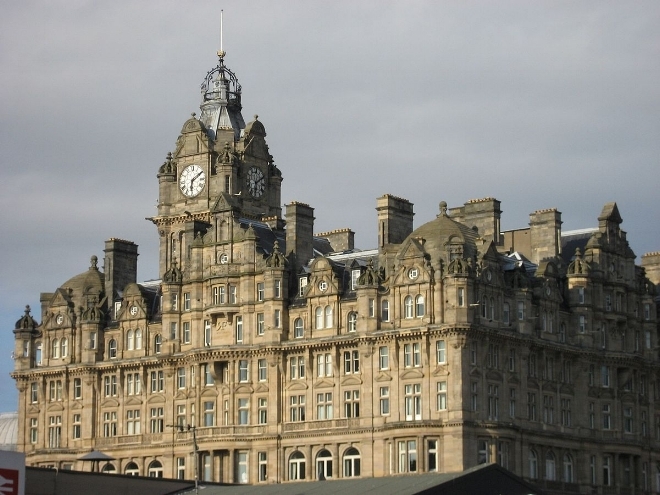 The Balmoral is situated at the North end of North Bridge on the corner of Princes Street, a stone throw away from Waverley Train Station and Princes Street Gardens and a few minutes walk from the iconic Royal Mile. This iconic hotel was used by J.K Rowling to finish writing Harry Potter and the Deathly Hallows, in a room which is now known as The J.K Rowling Suite. The Balmoral has 168 luxury rooms and 20 stunning suites, all of which come with the luxuries and adornments you'd expect from what is quite possibly Edinburgh's finest hotel. The Radisson Collection Royal Mile Hotel is on the corner of George IV Bridge and the Royal Mile, right in the heart of Edinburgh's Old Town. 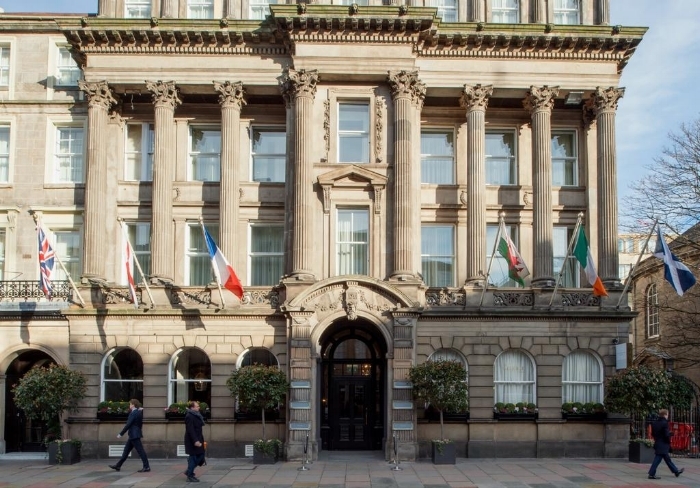 Within walking distance of Edinburgh Castle, Princes Street, Holyrood Palace, the National Museum and St Giles Cathedral, this 5 star hotel is perfectly located for tourists. It is probably fair to say that no hotel could be better located for enjoying the thrills of the Edinburgh Festival in August every year. The hotel is a blend of bold contemporary styling and classic Scottish decor and offers world-class service, food and accommodation. The Chester Residence offers unique 5 star luxury serviced apartments. This multi-award winning accommodation in the heart of Edinburgh's West End. Each of the 1 and 2 bed apartments takes up an entire floor of a Georgian townhouse and are designed to make you feel perfectly at home. Edinburgh’s West End is full of stunning Georgian architecture and has a good variety of pubs and cafes. The service provided at The Chester Residence is truly astounding. With a luxury pillow menu, in-house spa treatments, private car hire and chauffeur service available, you will not want for anything during your stay. Located on the iconic Royal Mile, the Radisson Blu Hotel in Edinburgh is a modern 4 star hotel boasting a range of facilities including a spa, fitness centre and indoor heated swimming pool. Waverley train station is nearby, as are many of Edinburgh's greatest attractions such as the National Museum, Holyrood Palace, Arthur's Seat and Edinburgh Castle. The interior is modern and stylish, and the bar within the hotel called Itchycoo is deservedly popular. The Hotel Du Vin in Edinburgh is located near to the Royal Mile, right in the heart of the Old Town. Many of Edinburgh's finest attractions are nearby, along with some stunning architecture and, in the month of August, the fabulous Edinburgh Fringe Festival. Hotel Du Vin is full of character and has 47 stylish rooms. The classy hotel also has a courtyard which transforms into an al fresco dining area during the summer, a popular cocktail bar, whisky room and cigar bothy. The Fraser Suites in Edinburgh is a handsome boutique hotel situated on St Giles Street (near the famous St Giles Cathedral), just off the iconic Royal Mile. The hotel offers a mixture of accommodation from luxury rooms, stunning suites and wonderfully-serviced catered apartments. It is said that the Fraser Suits has one of the finest views in Edinburgh, overlooking Prices Street Gardens and, on a clear day, onwards towards the Firth of Forth. Superb service, wonderful location and 4-star luxury combined. This 3-star hotel is brilliantly located and makes a great base from which to explore Edinburgh. With the dazzling attractions of the historic Old Town on the doorstep, you are within walking reach of many of the city's most popular attractions. Service is good, rooms are comfortable and well equipped. Staff are available 24 hours a day at this popular 3-star hotel which offers good service at a reasonable price. If you're looking for clean, comfortable accommodation in a great Edinburgh location at a competitive price, look no further! The location is superb for an affordable break and recently underwent a £1m refurbishment. This is a great choice for anyone looking to visit the Royal Mile or the Grassmarket, which has some of the most popular bars and restaurants in Edinburgh and a very lively nightlife. Despite being Edinburgh's oldest hotel, the Principal in George Street successfully manages to blend classic and contemporary tastes. It is ideally located, right in the heart of the city centre. This smart hotel provides an express check-in and out system, 24-hour room service and a coffee bar. The front desk operates at all hours and the staff are well informed. Just a few minutes from clubs and bars, this 4-star hotel also allows guests to explore what the local nightlife has to offer. During their stay at The Principal Edinburgh George Street, guests can drink, dine and unwind at the Printing Press Bar and Restaurant. The Principal Edinburgh George Street is found in the city's premier shopping area. Calton Hill, St Giles Cathedral and Edinburgh Castle are a brief walk away. Catering to the luxury and business market, this 4-star hotel suits both corporate visits and romantic getaways. It has received a certificate of excellence from Trip Advisor. The hotel overlooks two Edinburgh public parks, The Meadows and Bruntsfield Links, the latter of which takes its name from an association with golf and a pitch and putt golf course lies at one end. Bisque bar and restaurant offers a variety of locally sourced seasonal fare. The breakfast menu includes full English or Irish breakfast, or continental buffet, all with vegan and gluten free options. Though it is right in the centre of Edinburgh, Bruntsfield is a leafy and quiet area where you can walk in the tree lined parks, browse in the many small boutiques and gift shops selling bespoke items or have a drink in a variety of coffee shops and street cafes. 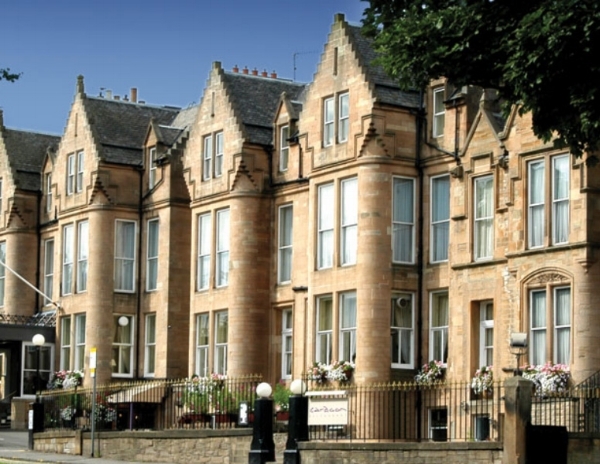 The Brunstfield, with its impressive Scots Baronial architecture, has lots of extras you might expect of a luxury hotel: a dry cleaning and laundry service, free parking, high speed internet, and an electric vehicle charging station as well as conference rooms and multilingual staff.